We host several outreach and service events during the year to help the community get to know us better as well as let us help serve the needs of Ridgefield. Some of these events are fundraising opportunities for our troop. Money raised goes to reduce the cost of scouting activities for our scouts as well as fund special events like high adventure trips. Webelos College: In January, our Boy Scouts host a day of learning for first and second year Webelos Scouts. In one day, the Webelos can complete up to three adventures pins, enjoy some pizza, and learn what it is like to be a Boy Scout. More information is on our event page. For questions please contact our Webelos College Event Chair. Graduation Signs: starting in April (after spring break) we offer durable Ridgefield High School color themed yard signs congratulating the current graduating class. Look for online ordering here. For questions please contact our Graduation Sign Event Chair. .
Father's Day 5K Race: On Father’s Day every year we host a 5K trail race on the grounds of the Ridgefield High School. Look for online registration starting in May. For sponsorship opportunities or questions please contact our Father's Day 5K Event Chair. St Stephen's Nutmeg Festival: In the summer, our Charter Organization, St Stephen's Church, hosts its annual community event, and our scouts help with running game booths and cleanup afterwards. Sturges Park Camporee Service Projects: this annual spring event involves cleanup of the area as well as refurbishing and building new structures at the park. 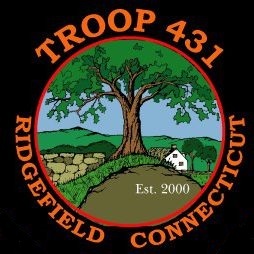 ScoutsCAN: we help sort recyclable cans and bottles at the town Transfer Station; money earned goes back to town initiatives like the Ridgefield Food Pantry. Eagle Projects: throughout the year our senior scouts lead individual project teams to help them earn their Eagle rank. Recent past projects include mapping trails at Farrington Woods Park, building A-frames to hold backpacks at the Boys and Girls Club, creating and implementing a recycling plan for Ridgefield town events, and collecting gently used shoes for Sole to Sole in New York City. If you have community service opportunities for our scouts, please contact our Community Service Chair.